Tony Perkins has delivered a masterpiece. We as Christians are constantly being bombarded with hostility and claims that we are "bigots" or "hateful." The future of the church is in the hands of young people today, and Tony Perkins delivers stories of young men and women standing up for their faith, for their beliefs, and for what the Bible says is right. This is no time for Christians to be silent, and Tony Perkins is using No Fear to help raise up a new generation of world-changers. Tony Perkins' No Fear is an amazing book that shows what young men and women are capable of when they unashamedly stand up for their faith and refuse to back down in the face of adversity. No Fear shows the importance of such courage in today's world. This is a must read book that will inspire a courageous heart in tomorrow's movers and shakers. Tony Perkins offers strong, respectable role models for young Christians to emulate as they enter into the world of adulthood. 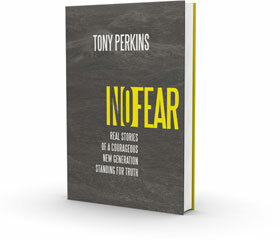 In his book, No Fear, using a biblical foundation, Perkins tells the story of young individuals who stood strong in their faith and convictions, despite facing adversity. As the world continues to spiral into an anti-Christian age, it's important to empower our young people with the strength and conviction to hold fast to the teachings of Christ, and No Fear does just that. This book is good news for America! Tony Perkins has discovered a new generation of young people who love following God more than the crowd. They are remarkable, brave, and fun. You will discover there is still hope for America and the world after reading their stories in No Fear!